Do you have South Australian ancestry? Almanacs and directories are a valuable genealogy resource for local, family and social historians as well as for researchers in other fields of Australian history. If you're searching your family history and building a family tree, it's an essential tool. The Province of South Australia was proclaimed on 28 December 1836, so this early almanac and directory gives us an insight into life in the young settlement. Listing 'principal merchants and inhabitants' from Adelaide and Port Adelaide, these are arranged alphabetically by surname, and each entry lists occupation and address. The full title explains a little more as to what is included: "Royal South Australian Almanack for 1839: Containing a daily calendar, a gardener and farmer's directory, a list of government officers, the addresses of the principal merchants and inhabitants, and all useful information regarding the province of South Australia". This is a valuable resource for early South Australia and its settlers. Officially titled The Royal South Australian Almanac and General Directory for 1845 (Allen, James) this small, but useful, book contains the names of people who were in South Australia in that year. The Almanac contains a range of useful information on various statistics, Acts, information on the geography of South Australia, together with Justices of the Peace, charges for licences and more. The Adelaide Directory section list names alphabetically by surname, together with their occupation and street address. The South Australian Almanac & Directory 1851 (A. Murray) is a rare early almanac and directory, and gives a fascinating insight into the South Australia of 1851. It also contains a great deal useful information for the researcher, not just local, family and social history. An important part of this volume is the directory, which is divided into three sections: Adelaide and Suburban, Albert Town and Port, and Country. The many advertisements included make for fascinating and informative reading. The South Australia Almanac & Directory 1865 (Boothby) is a detailed directory and almanac of nearly 450 pages includes much fascinating information. Divided into various sections this book begins with an index for the almanac section, followed by two calendars, one for farmers, and another of 'remarkable days', with a noted event written for every day of the year. Statistics such as population, immigration and BDM's are included here. The second part contains the Government and Official Directory followed by the Ecclesiastical, Municipal and Societies Directory, the Mercantile Directory and the Trades index. The major part of this publication is the Town and Country Directory listing residents town by town, together with their occupation and address. The final section is 100 pages of advertisements, many of which are illustrated. The South Australian Directory 1867, 1876 & 1881 (Boothby) consists of hundreds of pages of directory listings and advertisements, many of which are illustrated. Divided into several sections the first part consists of a directory of Adelaide listing residents in each street. The next is an alphabetical directory of people and their occupations. Then comes the Government and Official Directory followed by the Ecclesiastical, Municipal and Societies Directory. Then the Mercantile Directory which is followed by the Trades index and then the fascinating advertisements. The Almanac covers everything from the civil and military establishments, to sailing directions. From horticulture and agriculture in South Australia, to places of public worship. There are details on mines and mining, societies in SA, a calendar for the year, various statistics relating to the colony and details on public buildings. The Directory covers just Adelaide and Port Adelaide, and lists merchants in alphabetical order of surname together with their occupation and address. A useful source of information to establish the whereabouts of a person during this year. Compiled and published by A. Murray in 1847, this South Australian Almanac and Directory contains a calendar, gardening advice, government and law information, mining companies of South Australia, as well as ministers of religion. The Directory is divided into two sections, Adelaide, and Country. Each lists persons alphabetically surname, together with address, and occupation. Directories are an extremely useful tool for establishing when and where a person lived. However this is just a starting point. Look further in the directory to find out more information about the society in which they lived, the occupations they held and the people they knew. 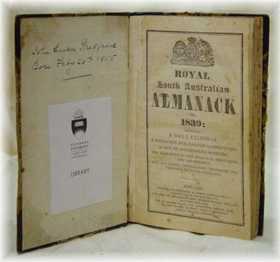 By 1847 the South Australian Almanac and Directory had become a well respected and popular publication. This edition was issued a little later than usual (February, rather than January), due to the influx of new businesses, and extensive revisions of the customs laws affecting imports. Covering everything from the Adelaide Building Society to eclipses, the General Post Office to the Harbour Department and sailing directions. There are details on colonial newspapers, mines and mining companies, various religion denominations, geographical and climate information, clubs and societies, civil and military establishments, a list of Justices of the Peace. The Town and Country Directory lists merchants in alphabetical order of surname together with their occupation and address. A useful source of information to establish the whereabouts of a person during this year. In 1848 South Australia was still a very young colony, having only been officially settled in November 1836 when the first immigrants arrived. This almanac and directory shows Adelaide and South Australia as it was growing. Listing all the regular features of an almanac such as a calendar, holidays, statistics, meteorological information, tariffs and postal information, as well as details on exports, legal and medical profession, military, religious, public institutions, pastoral and agricultural information. The 30 page directory section covers Adelaide, Port Adelaide and Albert Town, Suburbs, and Country. It gives names, addresses and occupations of the early residents in South Australia at the time. Officially titled "The Royal South Australian Almanac and General Directory for 1854" this is a small book, but no less useful. It contains the names of people who were in South Australia in 1854. Starting with an Almanac this contains all sorts of useful information on various statistics, and Acts, information on the geography of South Australia, together with Justices of the Peace, charges for Licences and more. The Directory section doesn't say that it it covers only Adelaide, but apart from a handful of names, they all look to live in the city. Names are listed alphabetically by surname, together with their occupation and street address. The Directory for Adelaide also covers Bowden, Brompton, Hackney and Millbank, Hindmarsh, Kensington, Magill, Marryattville, Norwood, Payneham, Port Adelaide, Prospect Village, Stepney, and Thebarton. Alphabetically listing householders together with their address and occupation, this is a way to verify where and when a person was at the time. The Almanac covers everything from boundaries of the hundreds and counties of South Australia, to horticulture, to Imperial Acts adopted in the Colony, fees for certificates and licenses, details of the members of the Government as well as the Governors. Banks, Companies and Societies are all listed, as are details of the postage, emigration, statistics and customs charges. This volume is divided into various sections, the first being the almanac which includes a calendar for the year, gardening advice, climate and geographical information, statistics relating to South Australia and more. The next includes numerous small directories covering government organisations, banks, mercantile, customs and shipping departments, companies, societies etc, Masonic Lodges and Friendly Societies. The major directory which consists of over 110 pages, firstly lists residents in Adelaide and suburbs together with their address and occupation. This is then followed by country regions. It concludes with 150 pages of advertisements, which give you an insight into life in this time. In this almanac and directory you can expect to find people named with their addresses under an Alphabetical directory (by town and district). Users should always refer to the display advertisements as they often provide names and addresses. Divided into various sections this book begins with an index for the almanac section which contains over 250 various topics. Everything from telegraph charges, to the ministers of churches, from the head officers in the Adelaide Fire Brigade to a farmer's calendar. From statistics, to information and names of people - you will find it all here. It also includes a Government Directory followed by Medical and Charitiable Institutions, Judicial and Legal Departments, Legal Profession, Military Establishment, Railways, Banks, Mercantile, Customs and Shipping, and Societies. The rest are more regional, and include Clare, the Barossa, Kadina, Mount Barker, Mount Gambier, Yorke's Peninsula and more. These list residents town by town, together with their occupation and address. The final section is 150+ pages of advertisements of local businesses, many of which are illustrated. Compiled by John Howell, of Rundle Street, Adelaide, this Almanac and Directory is a useful resource for historians with an interest in Adelaide and its residents in this era. Divided into three main sections - an almanac, a directory, and other information. The almanac contains a diary and calendar for the year 1872, as well as a farming and gardening calendar. The directory which is contained in about 50 pages covers Adelaide (North and South) and Port Adelaide, listing the householders alphabetically, together with their occupations and addresses. The third section deals with laws, government and parliamentary information, banks, post offices, medical personnel and railway timetables, and is an ideal reference for learning about the social history of the time.